Finally, great looking checked luggage that is as functional and durable as it is stylish. The Platinum Elite 25' Expandable Spinner is perfect for medium and long trips, accommodating everything you need, guarding against wrinkles with a built-in suiter and keeping everything organized under a deluxe tie-down system with integrated accessory pockets. Constructed with premium fabrics, leather accents and chrome zippers, this gorgeous bag also features a tip-resistant tapered expansion option that provides up to 2' additional packing capacity. How can I release the locking tabs. It is set at 000. It is brand new and I have not used it yet. I'm interested in the Travel Pro Platinum Elite 25 inch. Is the suiter inside removeable? PROS: We just got the luggage but it seems to be made very well and looks great. We have not used it yet. PROS: After years of using the "cheap" luggage, that we would get from "wherever", I believe we have found the "Right" luggage, for our leisure travel needs. These "Magnatrac" wheels , almost roll too easy. I almost need a brake to keep from having to hold the suitcase next to me. Even on what appears to be perfectly level ground, they will roll away. WOW! How nice it was to roll these on our flights and cruise, over the last 10 days. Very nice pockets inside. These are classy looking. We bought 2 of these. 1 Rich Espresso, and 1 Vintage Grey. Although their durability has yet to be proven, after our first trip with them, they still look new. CONS: There is only one design issue that I don't understand. There are 2 "mid-height" netted pouches that strap together with "Milwaukee" clips. While these are nice. The pouch near the lower half has the zipper located near the center of the luggage, which is good. 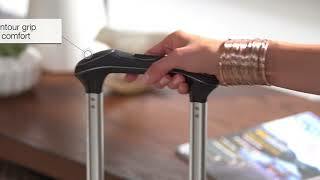 The upper pouch has the zipper located near the top of the luggage, which makes it difficult to use when the luggage is packed. Maybe I got a "mis-stitched" one. Or, just a bad design, and they need to turn the pouches 180 degrees. Also, mine came with a blue ink stain the size of a dime, on the light colored perforation which stands out like a sore thumb when you have the suitcase open. PROS: I travel for business and wanted this bag for the suiter. The tie down straps are much better than other models as they run vertically when the bag is upright and have small storage bags attached to them. The bag rolls well and has ample space for a few days in cold weather or a week in warm weather. It also has a removable plastic bag for wet items or use as a shower bag. I also like the built in luggage lock. CONS: I wish the suiter would be removable as a hanging bag and have space for two suits/sports coats. Rubber bumpers on the corners would be a great addition to stop wear on the edges. PROS: My husband and I travel a lot and have owned a lot of luggage. The Travelpro luggage is by far the best ever. I purchased my first Travelpro suitcase (25") over two years ago to replace a bag I only had a couple of years. I love the Inside features, sturdy handle which is adjustable, wheels that are the best of any luggage I have every owned, durability and the look of the bags. I since have purchased another 25" and two 21" carry ons. I purchased the Platinum Elite bags in Vintage Gray and couldn't be happier. PROS: These bags are beautiful. They are well thought out and precisely made with quality materials. Travel Pro has thought of everything. They are expensive but you get what you pay for. We originally purchased two 29", then two 25" and have just ordered two 21" carry-ons. It will be the last luggage we buy thanks to an all inclusive warranty for as long as we own the bags. CONS: If there is a con, it is the extremely large 29" bag. We had no trouble checking it for flights but it was barely half full and weighed the maximum allowable 50 lbs. However, for first class air, a road trip or lots of fluffy down winter clothing, it would be perfect. PROS: Too early to rate durability. Nice piece of luggage. Very attractive and functional.